Parrasch Heijnen Gallery is pleased to present Alteronce Gumby / Al Loving: Catching the Holy Ghost, an exhibition of new works by New York-based artist Alteronce Gumby (b.1985, Harrisburg, PA) in direct conversation with historic paper collage material from 1976 to 1993 by the late Abstract Expressionist painter Al Loving (b. 1935, Detroit, MI, d. 2005, New York, NY). Alteronce Gumby paints dynamic works subverting traditional understanding of light and color through nuanced application of pigment applied to his surfaces directly with his palms and fingers. The artist’s intensely textured works balance shadow with light and form with material. Using non-objective expression, Gumby’s ethereal objects are abstractions of emotions given tangible form where colors vanish and reappear. The lustrous tetraptych paintings are filled with subtle distinctions in color with each added shade mirroring unique moments that become part of one’s intricate identity. Diagonals appear in all of Gumby’s works, embodying a sense of forward velocity and fluidity of time. Particularly in the mosaic works, the viewer’s reflection becomes fragmented in the tesserae, a mix of broken stained glass, mirror, and iridescent glass. There is no fixed identity, the world and those in it are in a constant state of flux. The striated plane directly opposed to a matte monochromatic field sets up a twofold narrative of refraction and absorption. Al Loving’s paper collages of the late 1970s through the 1990s, are less about deconstruction of abstraction than they are about curiosity of what the hand can do to become one with the picture. 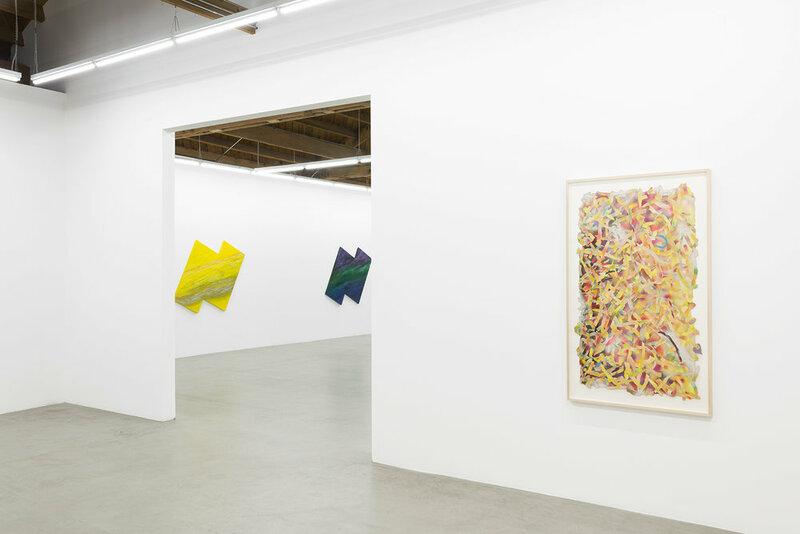 While Loving began with an innovative approach to hard-edge geometric abstraction, his work evolved into collage formats arriving at explosions of rich, fibrous understanding of shape, color, and placement. The exhibition’s title, as described by Gumby, refers to transcendence from the physical, to the idea of the spiritual. Painting becomes the artists’ undeniable language of awareness, as an act of transcendence, offering a form of liberation and tranquility through color. Chromatic gradients operate with powerful significance in both artists’ methods where reactive media unrestrainedly engage in their socio-political surroundings. Alteronce Gumby graduated from Yale University’s MFA program where he was awarded the Robert Reed Memorial Scholarship after earning a BFA from Hunter College, New York, NY. In 2017, he completed a year-long residency as the Harriet Hale Woolley scholar at the Fondation des États-Unis in Paris, France. He was granted the AAF/Seebacher Prize for Fine Arts as well as the Dumfries House Residency, Ayrshire, Scotland in 2015. Gumby was recently featured in solo exhibitions at Long Gallery, New York, NY and the Fondation des États-Unis, Paris, France. Al Loving was an Abstract Expressionist painter, and one of few African American artists recognized for his contributions to the movement. Loving received his BFA from the University of Illinois in 1963, and his MFA from the University of Michigan in 1965. Within a year of his move to New York City in 1968, Loving had a solo exhibition at the Whitney Museum of American Art and experienced early success and recognition. His work is featured in the collections of major museums nationally including: Crystal Bridges Museum of American Art, Bentonville, AR; the Detroit Institute of Arts, Detroit, MI; the Metropolitan Museum of Art, New York, NY; the Museum of Fine Arts, Boston, MA; the Museum of Modern Art, New York, NY; the National Gallery of Art, Washington D.C.; the Philadelphia Museum of Art, Philadelphia, PA; and the Whitney Museum of American Art, New York, NY. 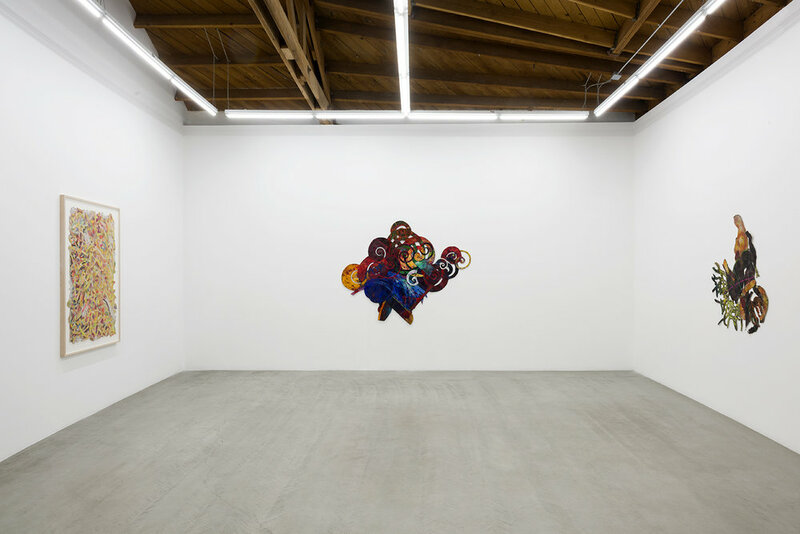 Alteronce Gumby / Al Loving: Catching the Holy Ghost will be on view at Parrasch Heijnen Gallery, 1326 S. Boyle Avenue, Los Angeles, from February 12, 2019 - March 23, 2019, with an opening reception taking place on February 15, from 6 - 8p. For more information, please contact the gallery at +1 (323) 943-9373 or info@parraschheijnen.com.